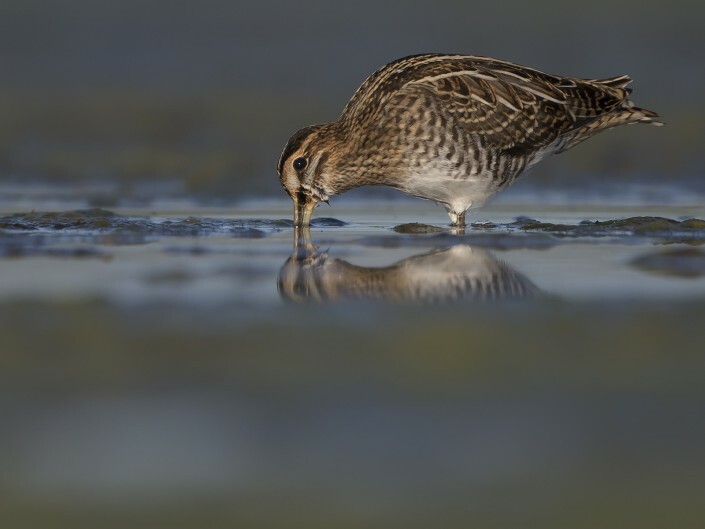 is a small, stocky wader native to the Old World. 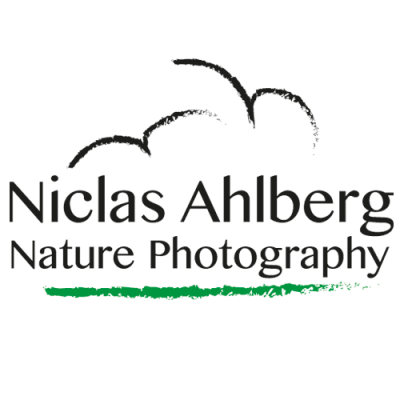 The breeding habitat is marshes, bogs, tundra and wet meadows throughout northern Europe and northern Asia. 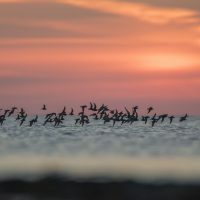 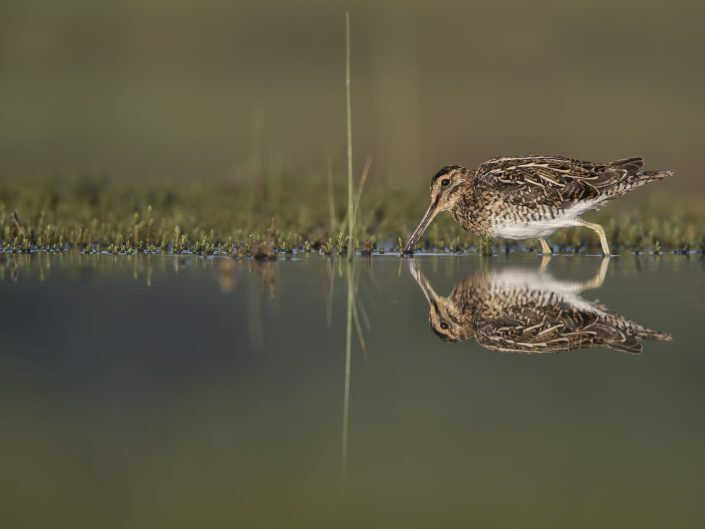 It is migratory, with European birds wintering in southern and western Europe and Africa (south to the Equator), and Asian migrants moving to tropical southern Asia. 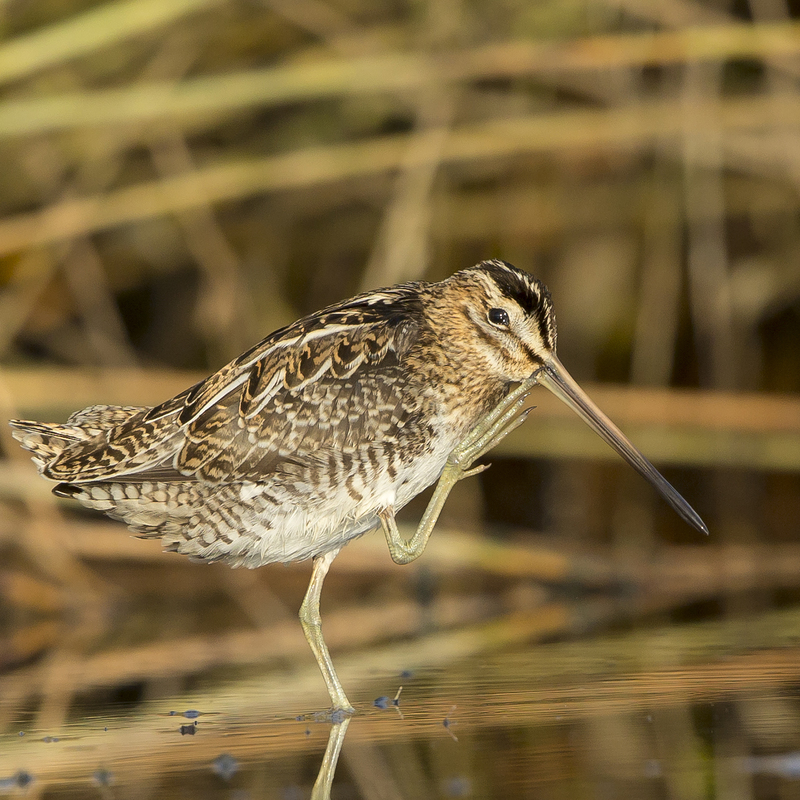 The North American Wilson’s snipe was previously considered the same species, and is listed as such in older field guides. The male performs “winnowing” display during courtship, flying high in circles and then taking shallow dives to produce a “drumming” sound by vibrating its tail feathers. 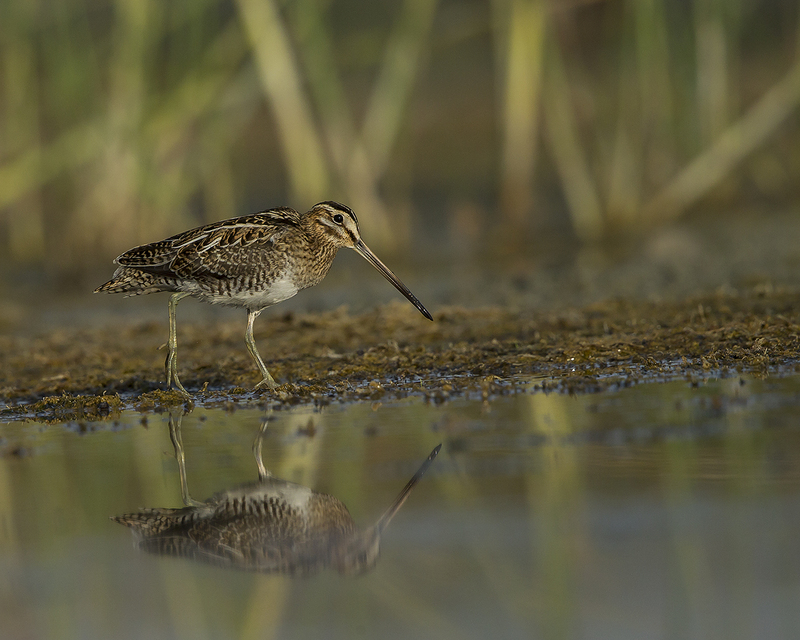 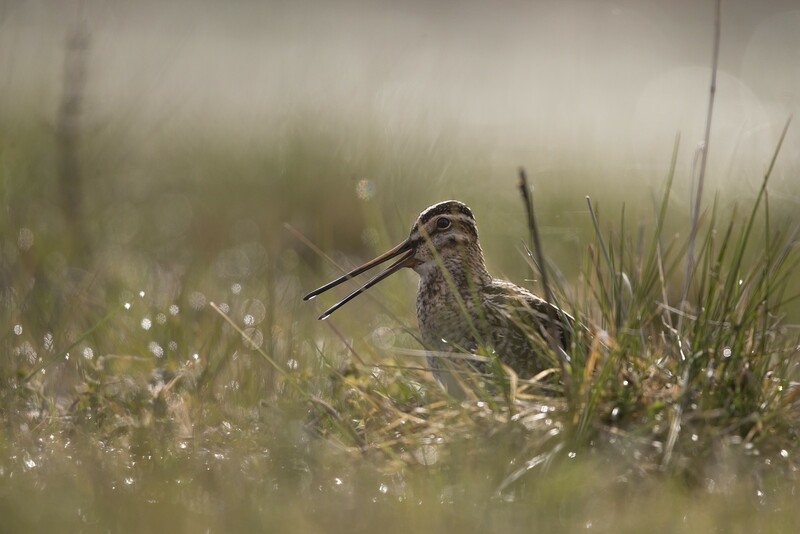 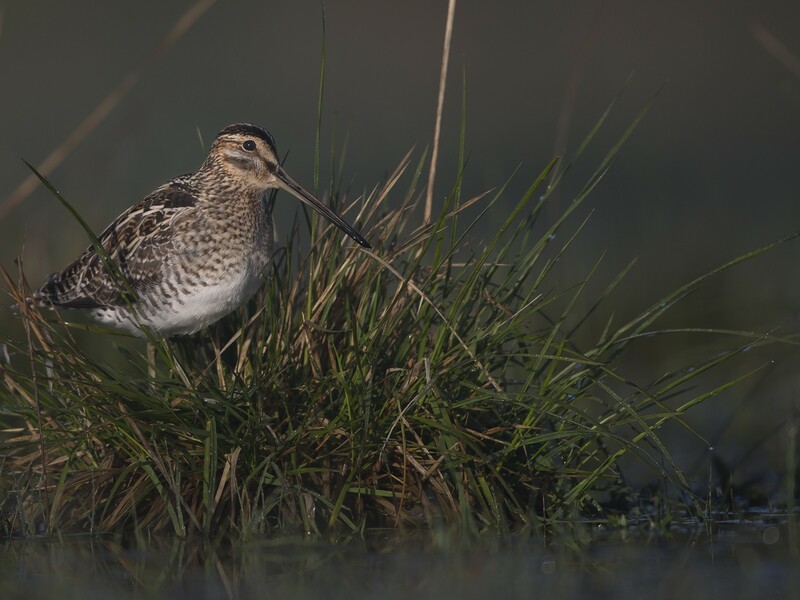 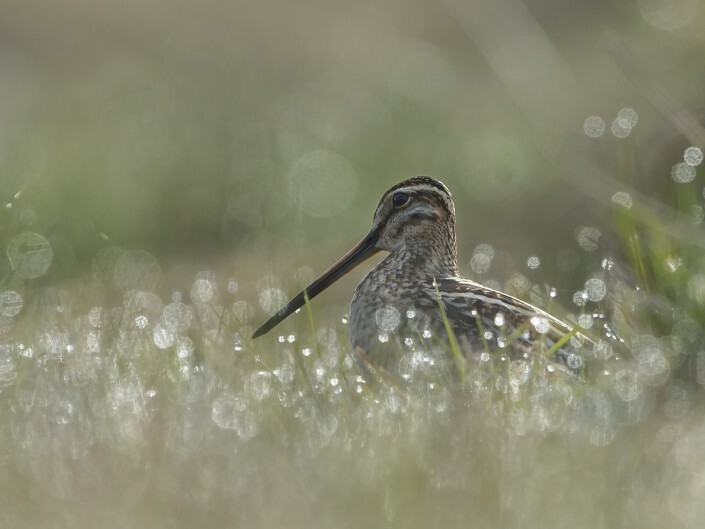 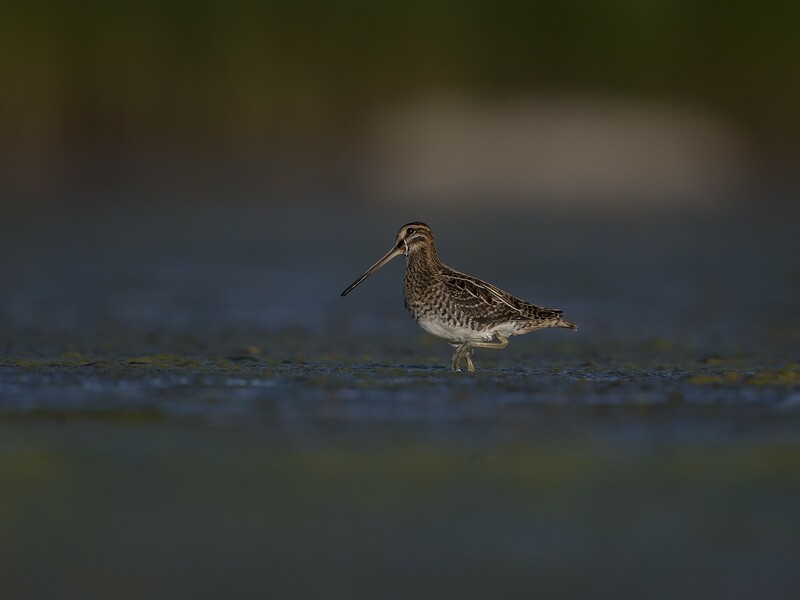 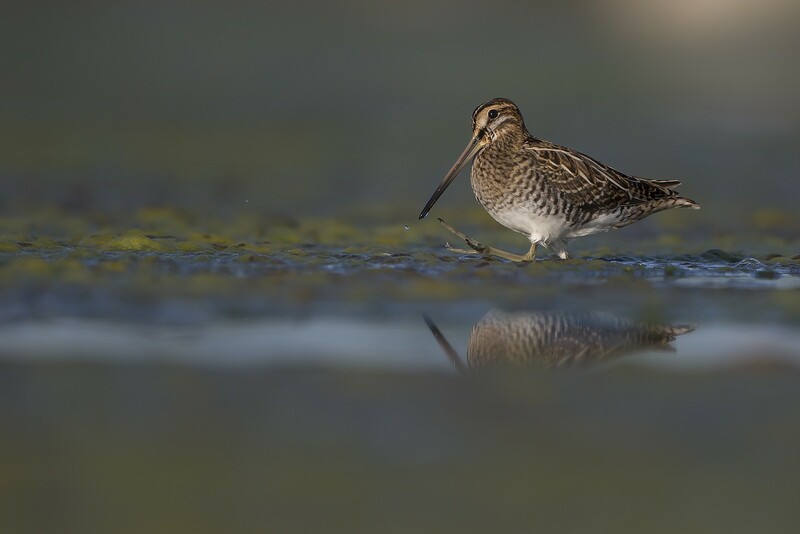 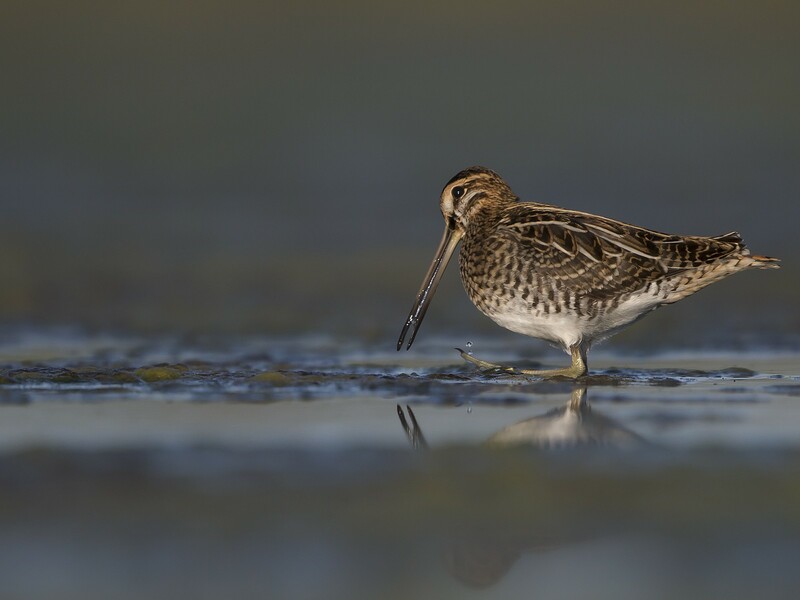 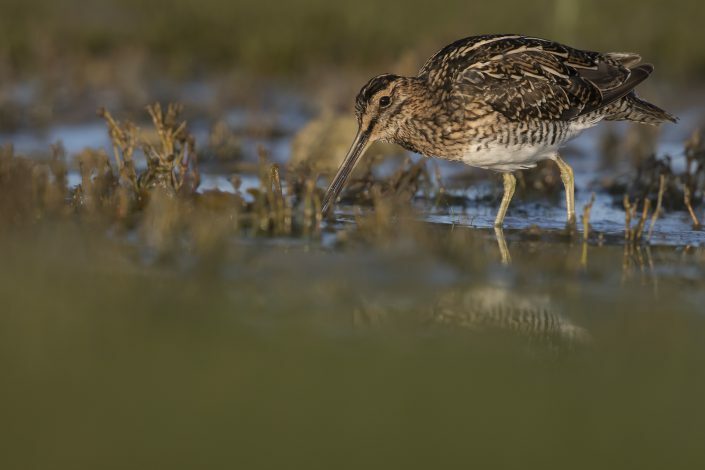 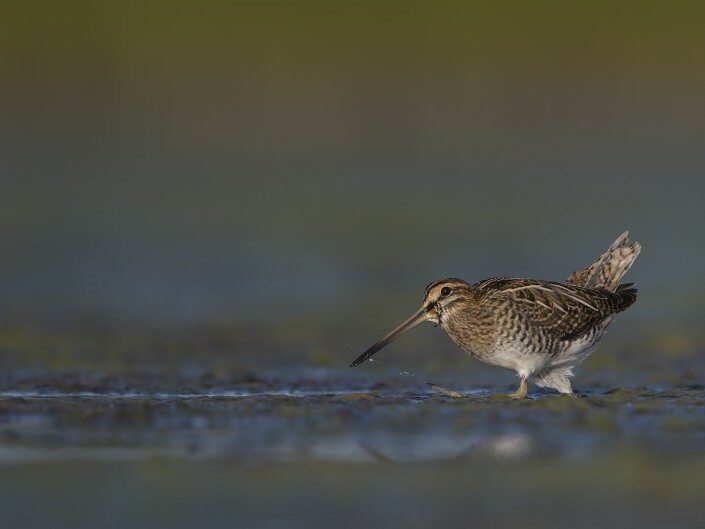 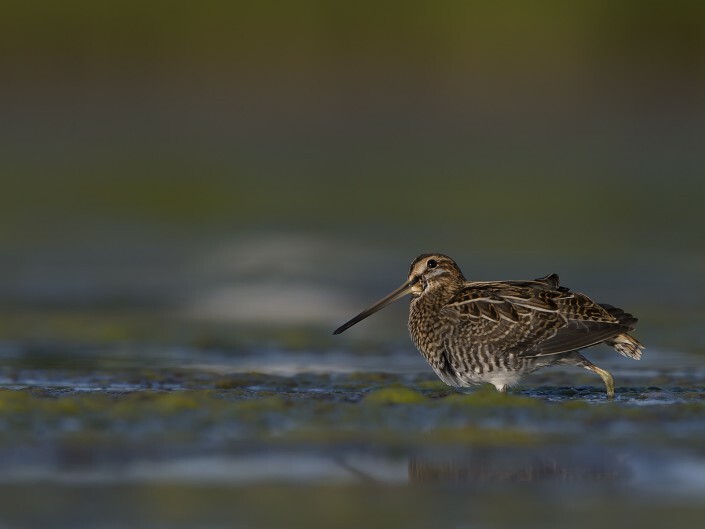 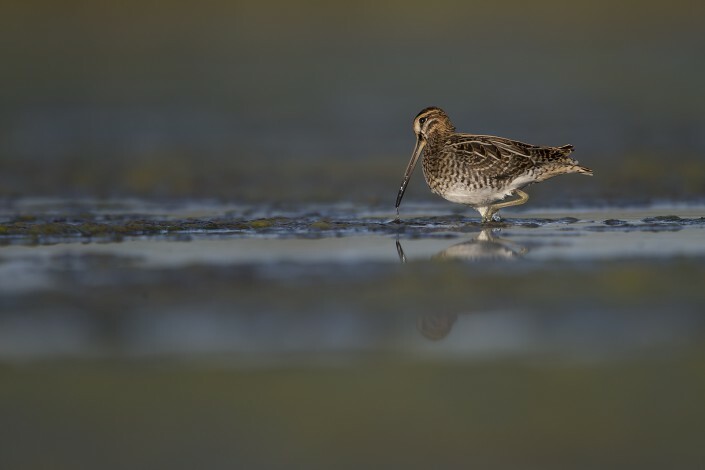 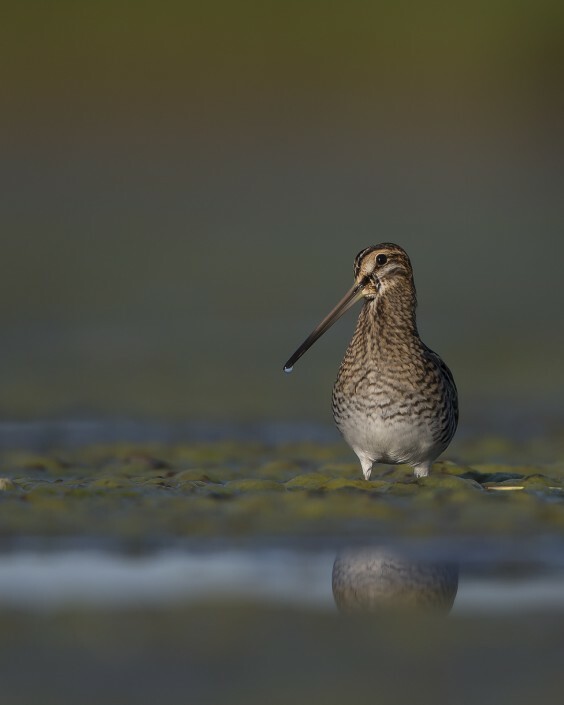 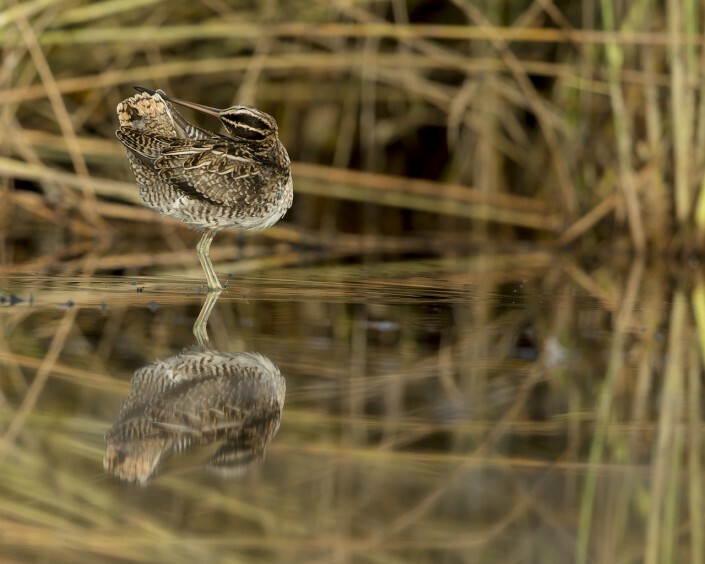 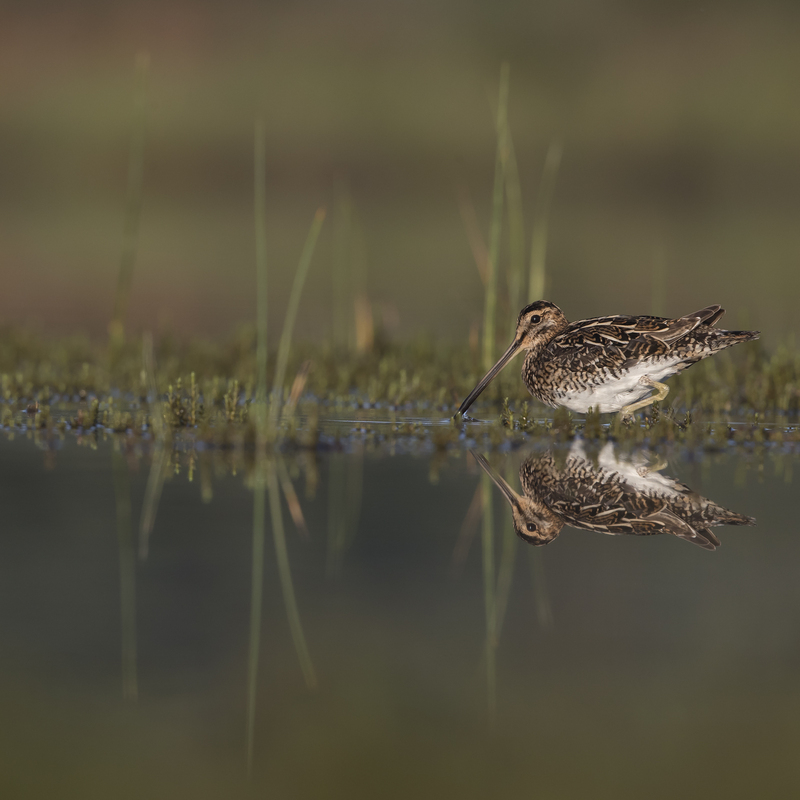 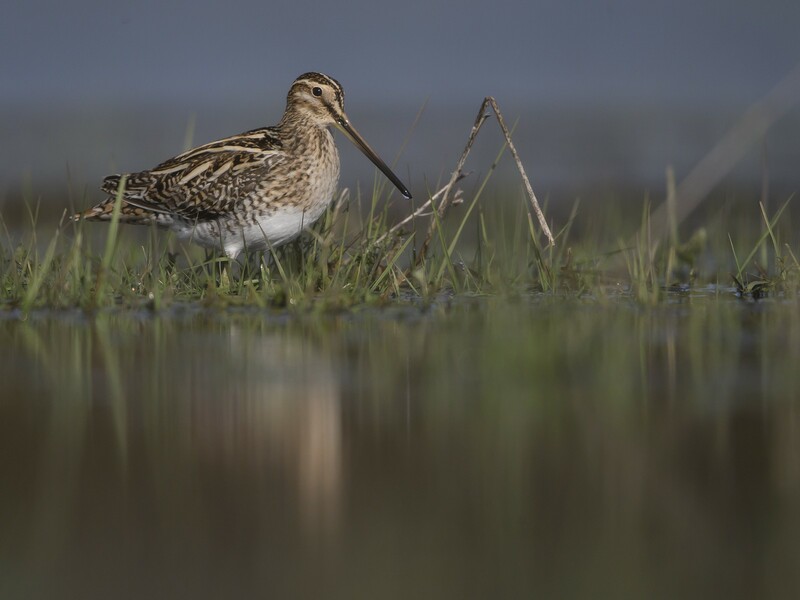 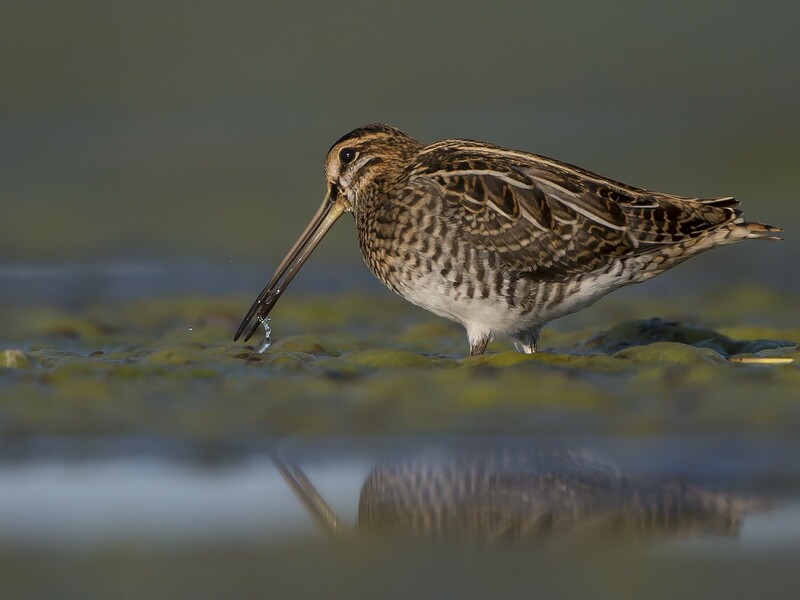 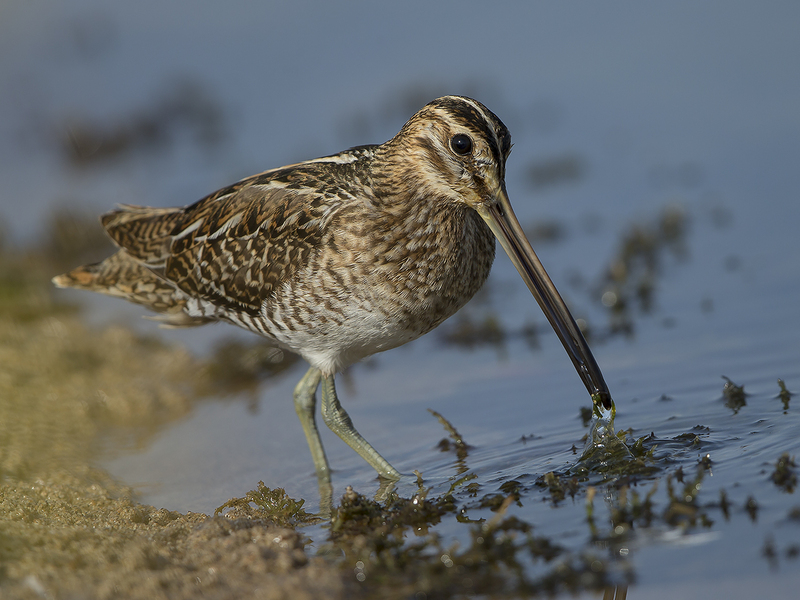 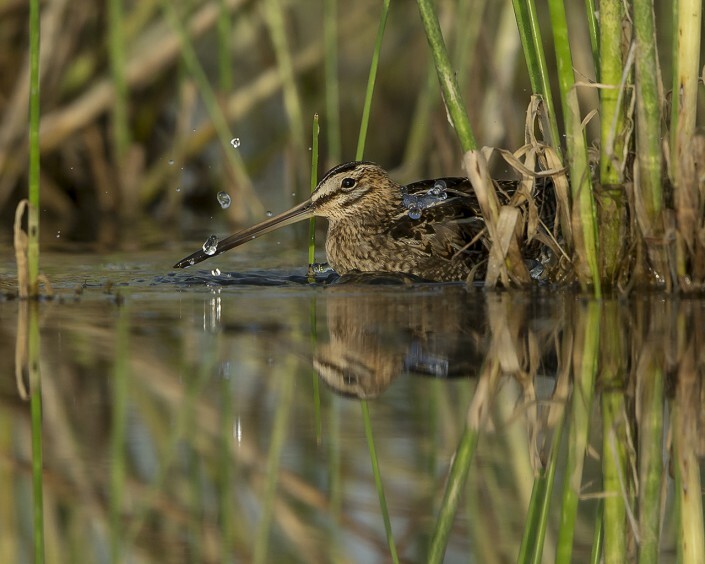 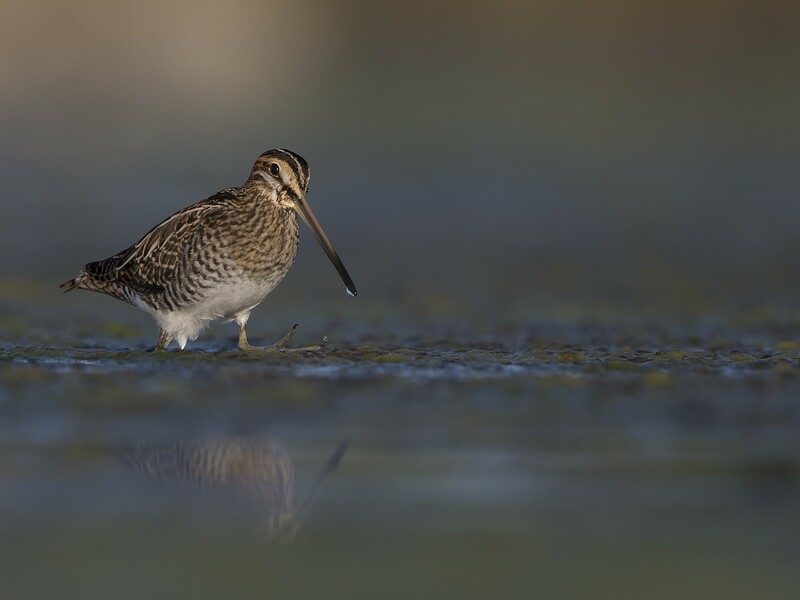 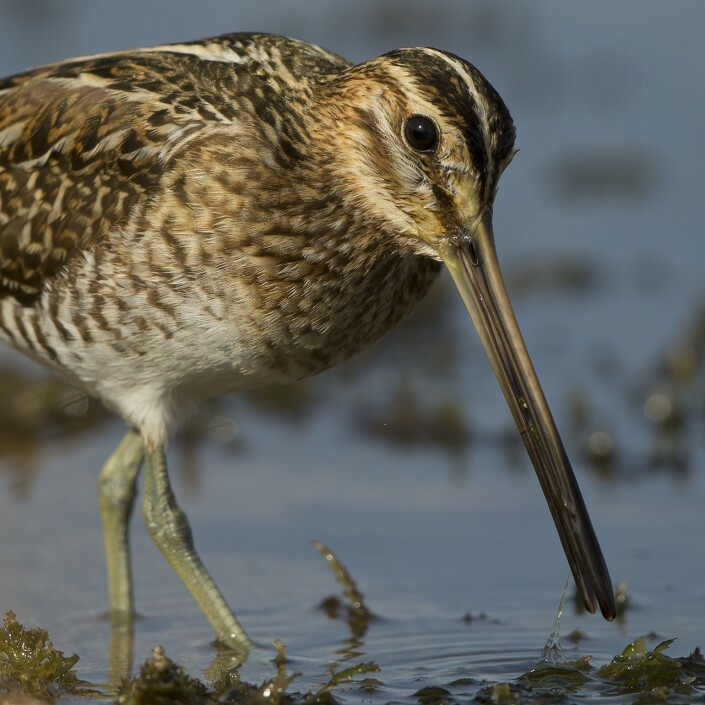 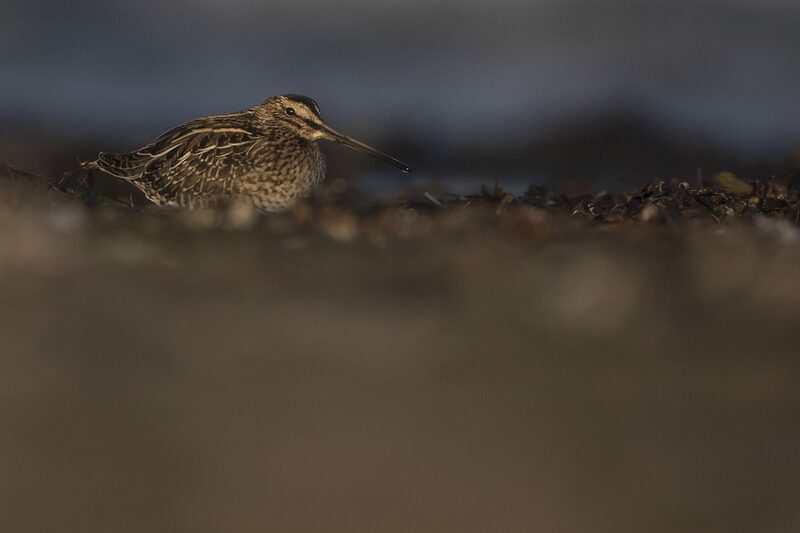 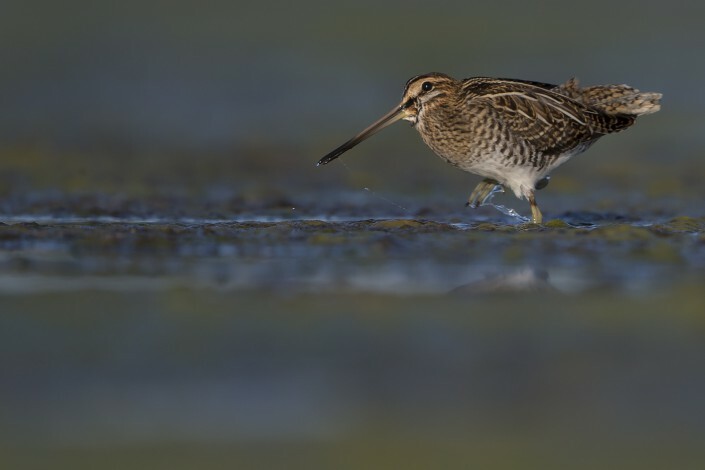 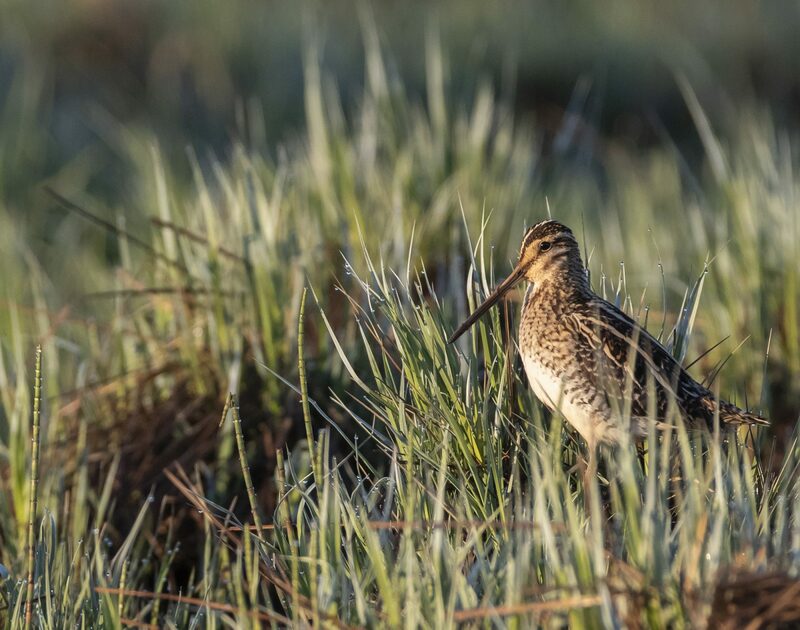 This sound has been compared by others to the bleating of a sheep or goat; hence in many languages the snipe is known by names signifying “flying goat,” “heaven’s ram,” as in Scotland by “heather-bleater” and in Finnish the name taivaanvuohi, “sky goat”. 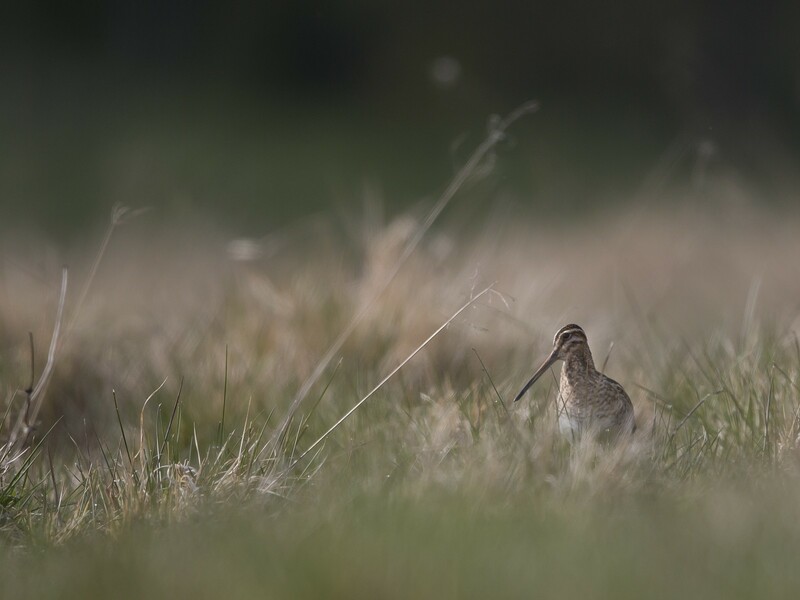 Common snipe nest in a well-hidden location on the ground, laying four eggs of a dark olive colour, blotched and spotted with rich brown, which are incubated by the female for 18–21 days. 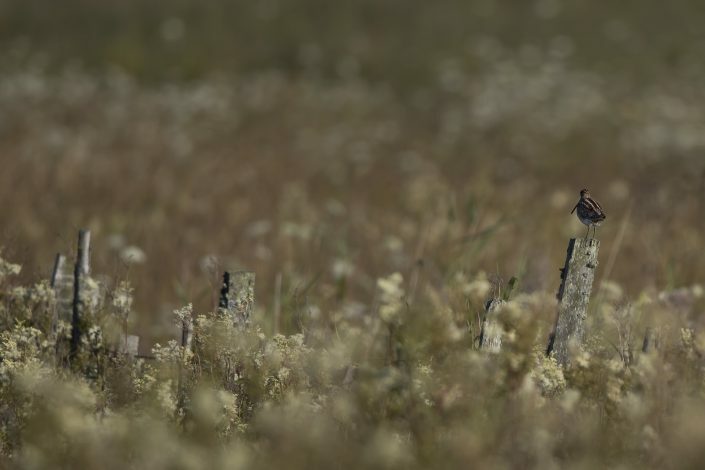 The freshly hatched young are covered in dark maroon down, variegated with black, white and buff. The young are cared for by both parents, each parent looking after half the brood, with fledging in 10–20 days.